Bidding farewell to the old year with fireworks and ushering the new year in laughter. It is my great pleasure to have you, my old and new friends, at this joyful occasion to celebrate the Chinese New Year. First of all, on behalf of the Chinese Consulate General in Kota Kinabalu, I would like to extend new year greetings to you all. Wish you a happy and prosperous Chinese New Year! Today we are very pleased to have the presence of Tuan Yang Terutama Tun, Toh Puan, Yang Amat Berhormat Datuk Seri Panglima Haji Mohd. Shafie and Yang Amat Berbahagia Datin Seri Panglima Shuryani at this reception. Thank you for coming! Let us welcome them with warm applause. Recently, we find lanterns and joyful people everywhere in Sabah. The Chinese New Year celebration activities have been held one after another, with the music of beating drums and lion dance in an lively festive atmosphere. This is my second Chinese New Year spent in Sabah. I am often asked by others about the difference of celebrating the Chinese New Year in Sabah and China. There are two things beyond my expectation: firstly, I did not expect that the festive atmosphere here is more intense than that in China. More than a hundred years ago, groups of Chinese forefathers crossed the sea, settled in Sabah and strived hard for a living. Although the homeland changed, the root of Chinese culture has been preserved and handed down from generation to generation, which is indeed praiseworthy. Secondly, I did not expect that Chinese New Year is a festival not only for Chinese people but also for everyone to celebrate together in Sabah. The cheerful scenes of different ethnic and religious groups celebrating the Chinese New Year can be easily spotted in Sabah. On the first day of the Chinese New Year, the Sabah State Government held the Chinese New Year Open House for the first time in the history celebrating the festival statewide. It fully demonstrates the characteristics of inclusiveness, mutual respect and harmonious coexistence of multi-ethnic cultures and religious in Sabah, which is a model of the world. Year 2018 was an extraordinary year. With the firm belief and extraordinary courage, both the Chinese and Malaysian people have made great strides in pursuing the development of their respective countries and have made remarkable achievements. In year 2018, China overcame various risks and challenges, promoted high-quality economic development, and achieved steady progress. Its GDP grew by 6.6%, totaling nearly 14 trillion US dollars, and China's contribution to the world economy exceeded 30%. Made in China, Created by China, and Built by China are profoundly changing the image of China. In year 2018, facing the intricate international environment, China continued to carry out in-depth reforms and launched more than 100 major reform measures. It continued to unswervingly expand its openness, adhere to the free trade system, and uphold the rules of multilateralism. It also successfully hosted the Boao Forum for Asia, the first International Import Expo, Forum on China-Africa Cooperation, Shanghai Cooperation Organization Summit, and launched the building of the Hainan Pilot Free Trade Zone. China has contributed the Chinese Wisdom, Approach and Strength to the peaceful development of the world through actively promoting the building of a community of shared future for mankind and a new type of international relations. The past year was also a remarkable year for China-Malaysia relations. Malaysia including Sabah has experienced historical changes. Under the joint efforts of both sides, China-Malaysia relations have withstood the test and steadily moved forward at the new starting point in history. Cooperation between China and Sabah in various fields has been further promoted. Last year, the trade volume between the two countries reached a record high, once again surpassing the 100 billion US dollar mark, reaching 108.6 billion US dollars, an increase of 13% over the previous year. China has been Malaysia's largest trading partner for ten consecutive years and largest investor in Malaysia’s manufacturing industry for three consecutive years. By the end of last September, China has invested in more than 411 projects in Malaysia’s manufacturing industry, creating over 70,000 jobs. China has been the largest source of foreign tourists to Malaysia for seven consecutive years. Last year, the number of Chinese tourists coming to Malaysia reached nearly 3 million. We are pleased to see that more Chinese are coming to Sabah for sightseeing. According to the latest statistics released by Sabah Tourism Board, the number of Chinese tourists visiting Sabah last year reached 593,600, nearly 600,000, an increase of 37.7%, far exceeding our original target of 500,000. This shows that Sabah is gaining more popularity in China, and it has become one of the favorite tourist attractions for Chinese. At the same time, there are more people from Sabah visiting China. Last year, the Consulate General issued more than 31,000 visas, an increase of 22% comparing with the previous year. At present, the number of direct flights from Kota Kinabalu to various cities in China has reached 121 flights per week, namely an average of 17 direct flights per day between China and Sabah. We are pleased to see that more Chinese companies are coming to Sabah for cooperation, investment and development in areas including infrastructure, real estate, electrical power, telecommunications, plantation, aquaculture, tourism and hospitality, logistics, manufacturing and others. Chinese companies have brought capital and technology to Sabah, promoted the construction of infrastructure and the development of various industries in Sabah, created more jobs, injected more vitality into the local economy, and brought real benefits to the local people. I am also pleased to inform you that, after many years of hard work of various sides, the first Confucius Institute in East Malaysia, jointly established by the Changsha University of Science and Technology in China and the University of Sabah, will soon be launched. We hope that the Institute will cultivate more talents who understand the languages and cultures of both countries and master professional skills, contributing to the China-Malaysia friendship and China-Sabah cooperation. When reviewing the achievements of the China-Sabah cooperation in the past year, I think of the Chinese idiom “Heaven rewards the diligent”. Behind the fruitful results, I see the industrious figures of the people in China and Sabah. There are tour guides waiting for the tourists at the airport late at night; laborers working on site under hot sun; businessmen who travel frequently between the two places, and children of various ethics who study Mandarin very hard. The cooperation between China and Sabah should certainly be attributed to the vigorous promotion of the governments of the two places, particularly the new Sabah State government, led by the Chief Minister Yang Amat Berhormat Datuk Seri Panglima Haji Mohd. Shafie, which has attached great importance to the China-Sabah cooperation. The Chief Minister has received several Chinese business delegations. His Excellency has repeatedly stressed on different occasions that Chinese companies are welcomed to invest in Sabah and the Sabah State Government is willing to create a favorable investment and business environment for Chinese investors. 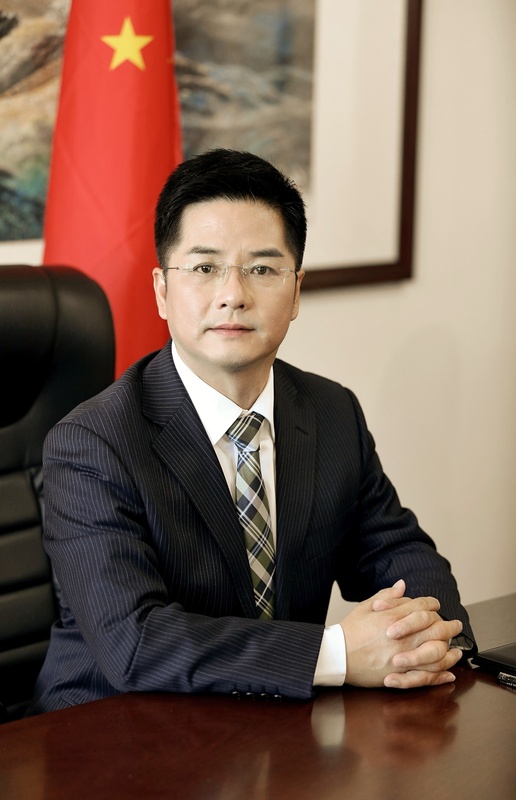 His Excellency also said that he will visit China and promote cooperation between the two places in person. I have promptly conveyed the message from the Chief Minister to the relevant authorities and companies in China. In particular, I would like to mention that the various Chinese communities and businessmen in Sabah have played an extremely important role in promoting the economic and trade cooperation, and cultural exchanges between China and Sabah. At the same time, your persistence and perseverance in developing the Chinese education and inheriting Chinese culture are impressive. 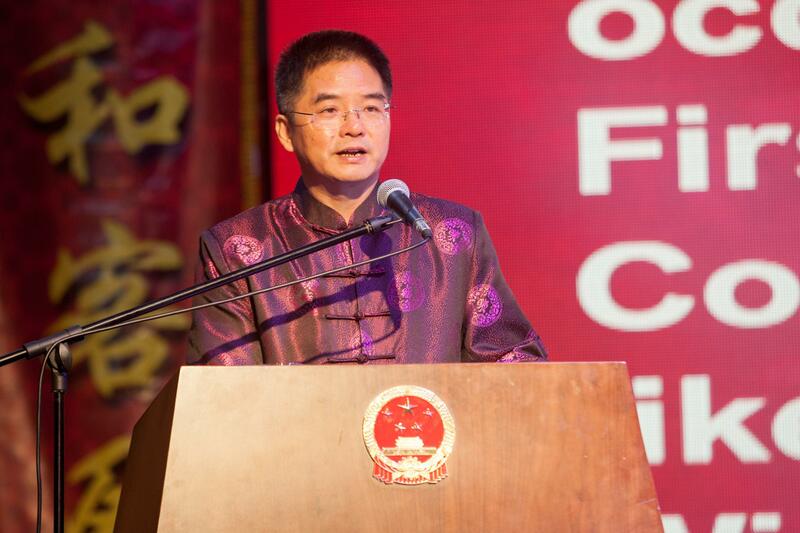 I would like to thank everyone from all walks of life for contributing to the China-Sabah friendship. It is everyone’s joint efforts that have promoted the exchanges, cooperation and the common development of the two places and brought benefits to the people. Today, we also have the representatives of Chinese companies and students attending the reception. Welcome! In recent years, more Chinese companies have settled in Sabah. They are active in the China-Sabah trade cooperation and has achieved good performance. The employees of Chinese companies work hard for the development of overseas business and contribute to the “Belt and Road Initiative”. I hope that you will continue to actively forge ahead, work hard, achieve more accomplishments, and make further contributions to the development of overseas business and the mutually beneficial cooperation between China and Sabah. Chinese overseas students are valuable talents for China. I hope that the students will cherish the time, study diligently, serve the motherland after you complete your studies in the future, and make contribute to the great "Chinese Dream" of national rejuvenation. I hope that the students are united and care for each other. At the same time, please pay attention to your safety and health, maintain a balance between work and rest, so that your family who are thousands of miles away won’t be worried. The Consulate General is always your home in the foreign land. Year 2019 marks the 45th anniversary of the establishment of diplomatic relations between China and Malaysia. For nearly half a century, China and Malaysia have always regarded each other as close neighbors with mutual trust and sincere partners. The relationship between the two countries has gone through the test of time and various challenges. The two countries has formed a community with a shared future. Just as the lyrics of the song, named "The Left Shoulder" recently produced by the Chinese Embassy in Malaysia to commemorate the 45th anniversary of the diplomatic relations between the two countries describe: "True friends and good neighbors will not be separated by distance…let’s climb the high mountains together.” This is a true portrayal of China-Malaysia friendship for 45 years. This year, the Consulate General will also launch a series of activities to commemorate the 45th anniversary of the diplomatic relations between China and Malaysia, including a piano symphony concert performed by Chinese and Malaysian artists, jointly organized with the Sabah State Government; and the China-Malaysia friendship Run in both Kota Kinabalu and Guangzhou at the same time, jointly organized with the Malaysian Consulate General in Guangzhou. Hopefully more people will understand the friendship between China and Malaysia through these activities, and more people will join us in promoting the friendship to a higher level. On this joyful occasion, let us wish for prosperity of China and Malaysia and long-lasting friendship between the two countries ! May the people of Sabah and Labuan lead a happy life! I wish you and your family good health, prosperity and happiness!